Soluble in any buffer with pH > 7.5. Up to 6 months in lyophilized form at 0-5°C. For best results, rehydrate just before use. After rehydration, keep solution at +4°C for up to 5 days or freeze at -20°C for up to 3 months. Aliquot before freezing to avoid repeated freeze-thaw cycles. Each vial contains 100 µg of NET peptide. Pancreatic islets communicate with lymphoid tissues via exocytosis of insulin peptides. Tissue-specific autoimmunity occurs when selected antigens presented by susceptible alleles of the major histocompatibility complex are recognized by T cells. However, the reason why certain specific self-antigens dominate the response and are indispensable for triggering autoreactivity is unclear. 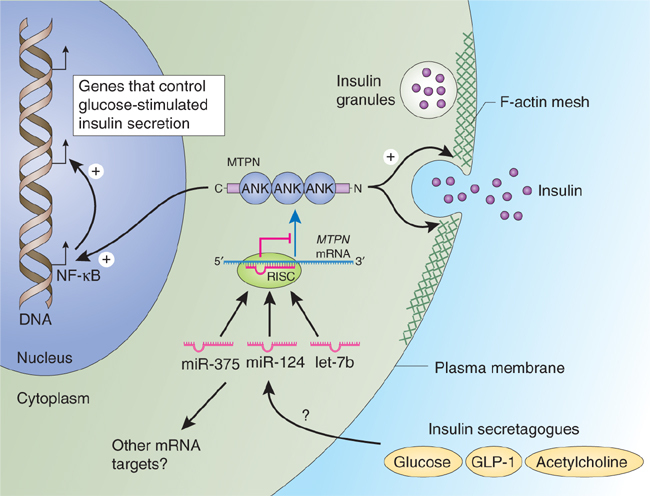 Spontaneous presentation of insulin is essential for initiating autoimmune type 1 diabetes in non-obese diabetic mice1,2. A major set of pathogenic CD4 T cells specifically recognizes the 12-20 segment of the insulin B-chain (B:12-20), an epitope that is generated from direct presentation of insulin peptides by antigen-presenting cells3,4. These T cells do not respond to antigen-presenting cells that have taken up insulin that, after processing, leads to presentation of a different segment representing a one-residue shift, B:13-214. CD4 T cells that recognize B:12-20 escape negative selection in the thymus and cause diabetes, whereas those that recognize B:13-21 have only a minor role in autoimmunity3-5. Although presentation of B:12-20 is evident in the islets3,6, insulin-specific germinal centres can be formed in various lymphoid tissues, suggesting that insulin presentation is widespread7,8. Here we use live imaging to document the distribution of insulin recognition by CD4 T cells throughout various lymph nodes. Furthermore, we identify catabolized insulin peptide fragments containing defined pathogenic epitopes in β-cell granules from mice and humans. Upon glucose challenge, these fragments are released into the circulation and are recognized by CD4 T cells, leading to an activation state that results in transcriptional reprogramming and enhanced diabetogenicity. Therefore, a tissue such as pancreatic islets, by releasing catabolized products, imposes a constant threat to self-tolerance. These findings reveal a self-recognition pathway underlying a primary autoantigen and provide a foundation for assessing antigenic targets that precipitate pathogenic outcomes by systemically sensitizing lymphoid tissues. Wan X, Zinselmeyer BH, Zakharov PN, et al. Pancreatic islets communicate with lymphoid tissues via exocytosis of insulin peptides. Nature. 2018;560(7716):107-111. Beta cells transfer vesicles containing insulin to phagocytes for presentation to T cells. Beta cells from nondiabetic mice transfer secretory vesicles to phagocytic cells. The passage was shown in culture studies where the transferwas probed with CD4 T cells reactive to insulin peptides. Two sets of vesicles were transferred, one containing insulin and another containingcatabolites of insulin. The passage required live beta cells in a close cell contact interaction with the phagocytes. It was increased by high glucose concentration and required mobilization of intracellular Ca2+. Live images of beta cell-phagocyte interactions documented the intimacy of the membrane contact and the passage of the granules. The passage was found in beta cells isolated from islets of young nonobese diabetic (NOD) mice and nondiabetic mice as well as from nondiabetic humans. Ultrastructural analysis showed intraislet phagocytes containing vesicles having the distinct morphology of dense-core granules. These findings document a process whereby the contents of secretory granules become available to the immune system. Vomund AN, Zinselmeyer BH, Hughes J, et al. Beta cells transfer vesicles containing insulin to phagocytes for presentation to T cells. Proc Natl Acad Sci USA. 2015;112(40):E5496-502. Autoreactive T cells specific for insulin B:11-23 recognize a low-affinity peptide register in human subjects with autoimmune diabetes. Previous studies in type 1 diabetes (T1D) in the nonobese diabetic mouse demonstrated that a crucial insulin epitope (B:9-23) is presented to diabetogenic CD4 T cells by IA(g7) in a weakly bound register. The importance of antigenic peptides with low-affinity HLA binding in human autoimmune disease remains less clear. The objective of this study was to investigate T-cell responses to a low-affinity self-epitope in subjects with T1D. HLA-DQ8 tetramers loaded with a modified insulin peptide designed to improve binding the low-affinity register were used to visualize T-cell responses following in vitro stimulation. Positive responses were only detectable in T1D patients. Because the immunogenic register of B:9-23 presented by DQ8 has not been conclusively demonstrated, T-cell assays using substituted peptides and DQ8 constructs engineered to express and present B:9-23 in fixed binding registers were used to determine the immunogenic register of this peptide. Tetramer-positive T-cell clones isolated from T1D subjects that responded to stimulation by B:11-23 peptide and denatured insulin protein were conclusively shown to recognize B:11-23 bound to HLA-DQ8 in the low-affinity register 3. These T cells also responded to homologous peptides derived from microbial antigens, suggesting that their initial priming could occur via molecular mimicry. These results are in accord with prior observations from the nonobese diabetic mouse model, suggesting a mechanism shared by mouse and man through which T cells that recognize a weakly bound peptide can circumvent tolerance mechanisms and play a role in the initiation of autoimmune diseases, such as T1D. Yang J, Chow IT, Sosinowski T, et al. Autoreactive T cells specific for insulin B:11-23 recognize a low-affinity peptide register in human subjects with autoimmune diabetes. Proc Natl Acad Sci USA. 2014;111(41):14840-5. Pathogenic CD4? T cells recognizing an unstable peptide of insulin are directly recruited into islets bypassing local lymph nodes. In the nonobese diabetic mouse, a predominant component of the autoreactive CD4(+) T cell repertoire is directed against the B:9-23 segment of the insulin B chain. Previous studies established that the majority of insulin-reactive T cells specifically recognize a weak peptide-MHC binding register within the B:9-23 segment, that to the 12-20 register. These T cells are uniquely stimulated when the B:9-23 peptide, but not the insulin protein, is offered to antigen presenting cells (APCs). Here, we report on a T cell receptor (TCR) transgenic mouse (8F10) that offers important new insights into the biology of these unconventional T cells. 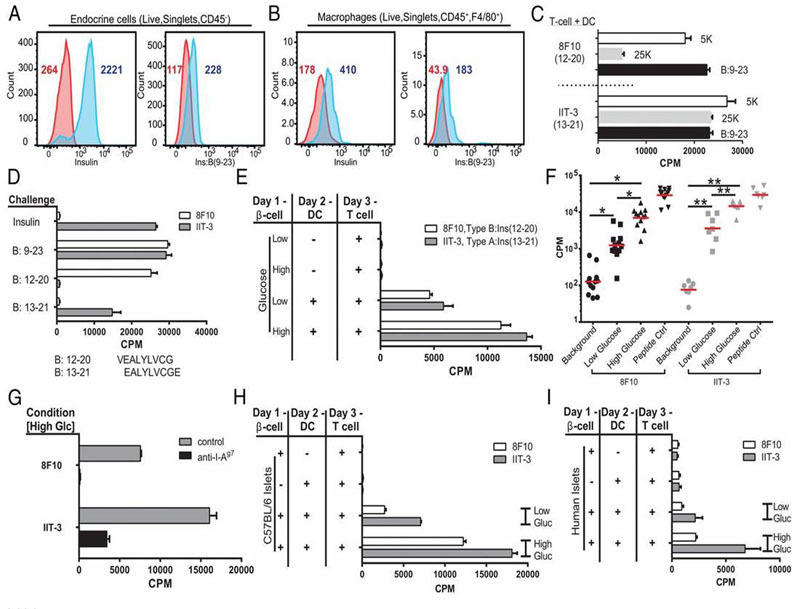 Many of the 8F10 CD4(+) T cells escaped negative selection and were highly pathogenic. The T cells were directly recruited into islets of Langerhans, where they established contact with resident intra-islet APCs. Immunogenic insulin had to be presented in order for the T cells to localize and cause disease. These T cells bypassed an initial priming stage in the pancreatic lymph node thought to precede islet T cell entry. 8F10 T cells induced the production of antiinsulin antibodies and islets contained immunoglobulin (IgG) deposited on β cells and along the vessel walls. Mohan JF, Calderon B, Anderson MS, Unanue ER. Pathogenic CD4? T cells recognizing an unstable peptide of insulin are directly recruited into islets bypassing local lymph nodes. J Exp Med. 2013;210(11):2403-14. BACKGROUND: Metabolic risk factors like insulin resistance and dyslipidemia are frequently observed in severly obese children. We investigated the hypothesis that moderate weight reduction by a low-threshold intervention is already able to reduce insulin resistance and cardiovascular risk factors in severely obese children. METHODS: A group of 58 severely obese children and adolescents between 8 and 17 years participating in a six-month-long outpatient program was studied before and after treatment. The program included behavioral treatment, dietary education and specific physical training. Metabolic parameters were measured in the fasting state, insulin resistance was evaluated in an oral glucose tolerance test. RESULTS: Mean standard deviation score of the body mass index (SDS-BMI) in the study group dropped significantly from +2.5 ± 0.5 to 2.3 ± 0.6 (P < 0.0001) after participation in the program. A significant decrease was observed in HOMA (6.3 ± 4.2 versus 4.9 ± 2.4, P < 0.03, and in peak insulin levels (232.7 ± 132.4 versus 179.2 ± 73.3 μU/mL, P < 0.006). Significant reductions were also observed in mean levels of hemoglobin A1c, total cholesterol and LDL cholesterol. CONCLUSIONS: These data demonstrate that already moderate weight reduction is able to decrease insulin resistance and dyslipidemia in severely obese children and adolescents. Grulich-henn J, Lichtenstein S, Hörster F, Hoffmann GF, Nawroth PP, Hamann A. Int J Endocrinol. 2011;2011:541021. Beta cells transfer immunogenic insulin to phagocytes. Flow cytometry plots of isolated endocrine cells (A) or intraislet macrophages (B) stained with antibodies reactive to insulin and to the B:9–23 peptide. Cells were gated as indicated in the panels. Red histograms correspond to the isotype control antibody staining. Blue histograms are either antiinsulin or anti-B:9–23 peptide staining. Numbers in each plot indicate the mean fluorescence intensity for their respective histogram. (C) Secretory granules were isolated by differential centrifugation from beta cells isolated from NOD.Rag1−/− mice and offered to spleen DCs, and the response of the 8F10 T cell or IIT-3 T cell was then assayed. Shown are the responses to the 5,000 and 25,000 × gfractions (in 5K and 25K, respectively) and as a control to the B:9–23 peptide. (D) The characterization of the two CD4 T cells to insulin. The FLT-3L DCs were incubated with insulin or with the B:9–23 peptide, each at 10 μM. 8F10 reacts with peptides B:9–23 or B:12–20 (sequence shown below the graph) but not with insulin or B:13–21. IIT-3 reacts with insulin and peptides B:9–23 and B:13–21. (E) A representative assay (of n > 25). Indicated are the cells used in the assay. Beta cells were from 6-wk-old NOD.Rag1−/− mice; the APCs were DCs obtained from the spleen of mice previously injected with FLT-3L. Background response of the T cells never exceeds 150 cpm. (F) Summary of the first series of experiments. The explanation is in the text. (G) Antibody to I-Ag7 inhibits the transfer. The culture included the presence or absence of 10 μg/mL of the antibody Ag2.42.67 specific for I-Ag7. (H) Same as in A but testing islets from B6 mice. Shown is a representative experiment of two experiments. (I) As in A but testing human islets. Figure from : Vomund AN et al. Proc Natl Acad Sci U S A. 2015 Oct 6;112(40):E5496-502. Protein Kinase Mitogen-activated Protein Kinase Kinase Kinase Kinase 4 (MAP4K4) Promotes Obesity-induced Hyperinsulinemia. Roth flach RJ, Danai LV, Distefano MT, et al. J Biol Chem. 2016;291(31):16221-30. Glucose Induces Mouse β-Cell Proliferation via IRS2, MTOR, and Cyclin D2 but Not the Insulin Receptor. Stamateris RE, Sharma RB, Kong Y, et al. Diabetes. 2016;65(4):981-95. Insulin-like growth factor 1 (IGF-1) stabilizes nascent blood vessels. Jacobo SM, Kazlauskas A. J Biol Chem. 2015;290(10):6349-60.